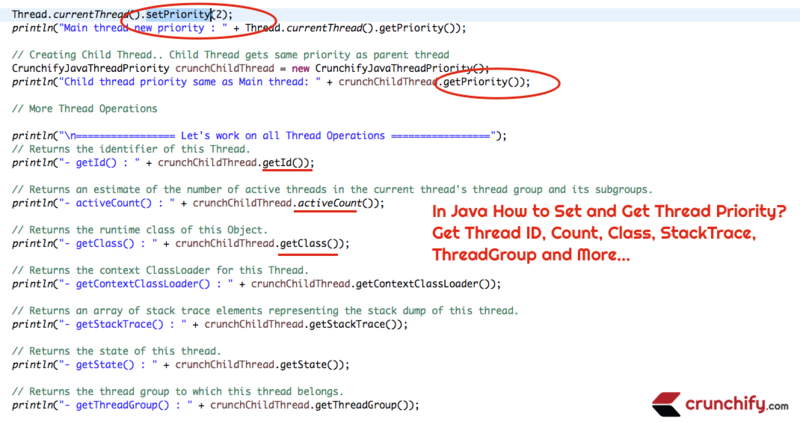 In Java multithreading programming, sometimes you may need to set Thread priority in order for it to execute before another thread. You can set and get Thread priority programmatically using Thread.setPriority(5) and Thread.getPriority() methods. What is default thread priority? It’s 5. What is a MAX_PRIORITY number? It’s 10. What is MIN_PRIORITY NUMBER? It’s 1. We are going to create class CrunchifyJavaThreadPriority.java. Next we will create two child thread and will print its priority. Result would be 5. Next we will set priority to different number and will print the same. Next task is to print default Main() thread’s priority, print it, change it again and print it. On Next section, we will take a look at all other Thread Operations. isAlive(), isDaemon(), getStackTrace(), isInterrupted(), etc. Kindly take a look at all comments in program for more explanation. * Program: Simplest way to Set and Get Thread Priority. 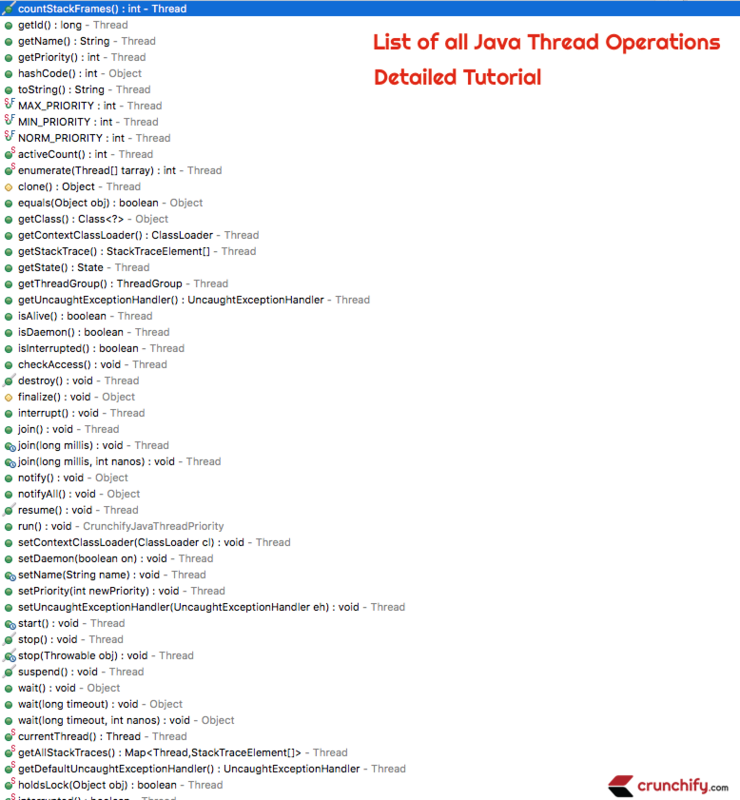 Also get Thread ID, Count, Class, StackTrace, ThreadGroup and More. // Returns the identifier of this Thread. // Returns an estimate of the number of active threads in the current thread's thread group and its subgroups. // Returns the runtime class of this Object. // Returns the context ClassLoader for this Thread. // Returns an array of stack trace elements representing the stack dump of this thread. // Returns the state of this thread. // Returns the thread group to which this thread belongs. // Returns a map of stack traces for all live threads. // True if this thread is alive. // Tests whether this thread has been interrupted.